Busy days call for easy recipes. 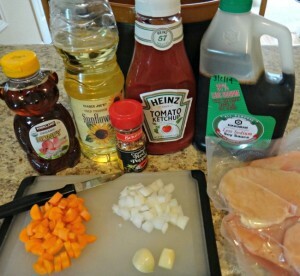 Slow Cooker Honey Chicken requires just 10 minutes of prep and the slow cooker does the rest. Your family will love the slightly sweet, slightly tangy (with just a wee bit of spice) flavors. It’s been a while since I’ve posted a new recipe – not by by design, but more a result of adjusting to new schedules and finding the time to actually write a post. I hope to get back to posting on a more regular schedule soon. Thanks for sticking around during the lean times! 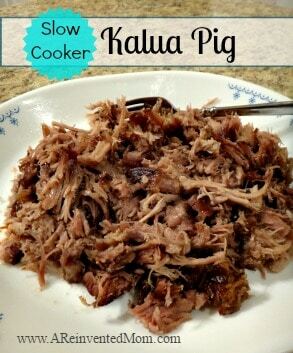 Today I have a quick and easy slow cooker recipe for you. 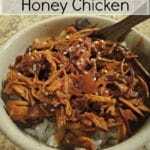 Slow Cooker Honey Chicken is a hit with the Teens and adults in my house. I realize this dish doesn’t look very “special”, but you are going to have to trust me on this one. Even The Girl (who isn’t a huge fan of meat) loves this dish, going so far as to hide the tiny cup of leftovers in the back of the refrigerator so no one else would eat them (true!). I need to start doubling this recipe, because we almost polished off the entire dish the last time I made it. You only need to whip up a batch of rice, add a side salad and some fruit, and you have a full meal on the dinner table in no time. The ingredient list is basic and you likely have everything you need in your pantry. I’ve linked this recipe at: Full Plate Thursday at Miz Helen’s Country Cottage and Weekend Potluck at The Better Baker. A Reinvented Mom is a participant in the Amazon Services LLC Associates Program, an affiliate advertising program designed to provide a means for sites to earn advertising fees by advertising and linking to Amazon.com. This post may contain an affiliate link(s). If you choose to click on the link and/or make a purchase, I may be paid a small amount. All opinions are my own. Busy days call for easy recipes. 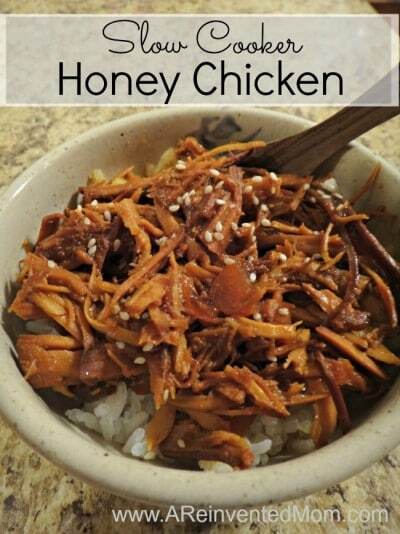 Slow Cooker Honey Chicken requires just 10 minutes of prep and the slow cooker does the rest. Your family will love the slightly sweet, slightly tangy (with just a wee bit of spicy) flavors. Place chicken breasts, onions and carrots in slow cooker. Combine the next 7 ingredients and mix well. Pour over chicken, carrots and onions. Cover and cook on low for 5-6 hours (or until chicken is cooked through). Remove chicken from slow cooker and shred with 2 forks. Place shredded chicken back in slow cooker and stir to combine with the sauce. Serve over rice and sprinkle with sesame seeds (if using) before serving. 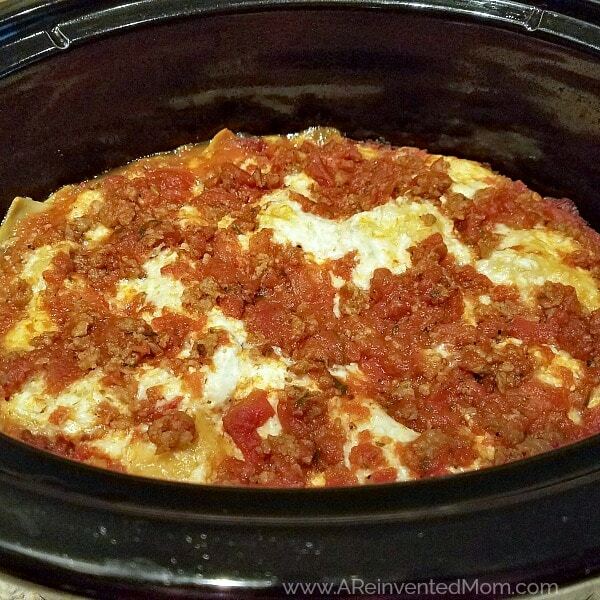 Thank you for sharing, I am always looking for new slow cooker recipes. This is my kind of dinner ! Thanks for linking up with What’s Cookin’ Wednesday! I love this recipe so much it has been featured! Thank you so much for linking up at Tasty Tuesday! Your recipe has been pinned to the Tasty Tuesday Pinterest board! Please join us again this week! This looks so yummy! Pinned. Cassie has chosen your dish to be featured at our party tomorrow night at 7 pm. Woo Hoo! Yay! I love honey sesame chicken. 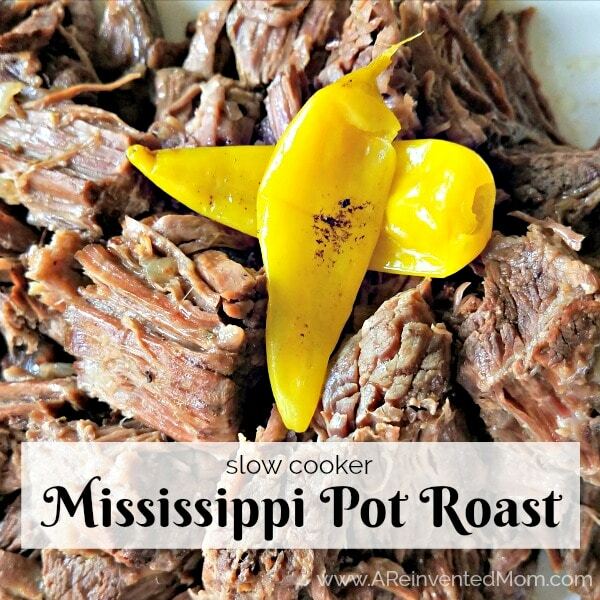 😀 The only thing that makes it even better is the convenience of throwing it all in a crockpot. Can’t wait to try this out! I love your Honey Sesame Chicken and can’t wait to taste it! Thanks so much for sharing your awesome post with Full Plate Thursday. Have a great week and come back soon! Thanks for the invitation Shari! I’ll check it out. This looks amazing…pinning now…cooking soon! Thank you! Thanks, Becki! Let me know how you like it. This sounds really good! I wonder if I could make a big batch and freeze half of it for a future meal? Thanks for the recipe – I am going to try this one. I bet it would keep in the freezer for a little bit, Vickie. I haven’t done so yet, but I have frozen similar dishes with good results. Come back & update if you do freeze some. This looks right up my alley!! Pinning and trying! Thanks. Thanks Elizabeth! I hope you enjoy it as much as we do.